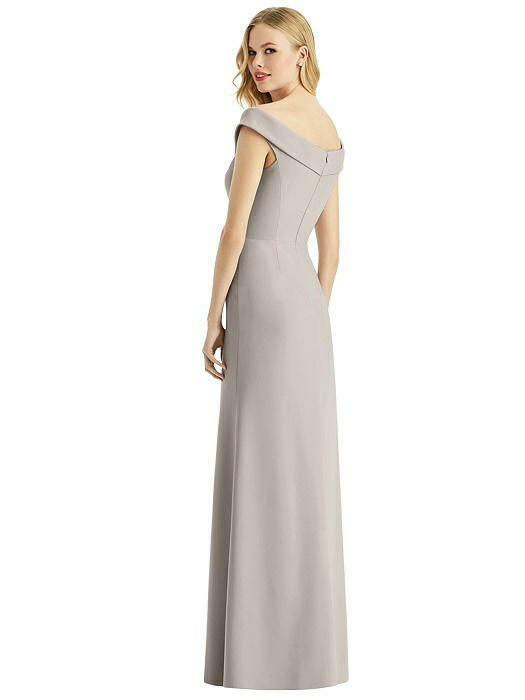 Developed to delight, this full-length crepe dress features charming off the shoulder details. A romantic surplice cuff neckline creates an overall balanced look when coupled with the side front slit of the skirt. The skirt on this style is fairly fitted and you will need to pay attention to waist and hip measurements. The bodice is made of a stretch material so there is give at the bust as well. Fit Tip: The skirt on this style is fairly fitted and you will need to pay attention to waist and hip measurements. The bodice is made of a stretch material so there is give at the bust as well.